I bought Paris at Harney & Sons SoHo location in New York City during my visit back in October 2017 and I couldn’t resist getting it after one of the salespeople working in the store told me that it was one of Harney & Sons’ best selling teas. So of course I had to give it a try. Paris came to me in a metal tin, the tea itself is loose in a tin (not like Bancha where the tea was in a foil package inside of the tin). The aroma of the dry leaf is primarily fruity with a hint of vanilla. Paris consists of: black tea, oolong tea, black currant flavour, vanilla flavour, bergamot oil, and caramel flavour. 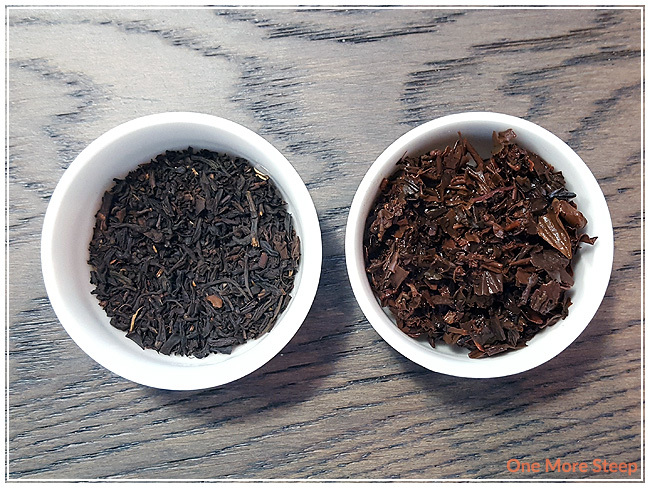 If you asked me to pick out the oolong tea in this blend, I’d probably laugh at you. There are some leaves that appear more twisted and long than others, but the aroma of this tea is beautiful. I love the fruity aroma – I’ve actually never eaten black currant before (but I have had black currant candy so I can pick out the flavour), but it smells so good. 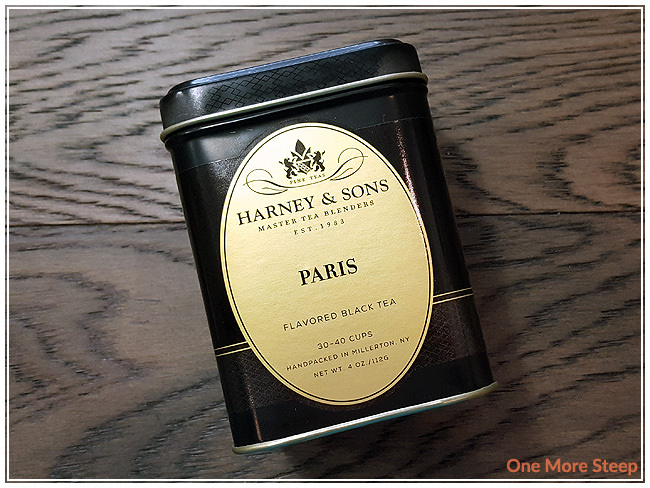 Harney & Sons recommends steeping Paris in 212°F (100°C) water for 5 minutes, and then to “Remove the tea leaves. Relax and enjoy.” Well, don’t mind if I do! I steeped Paris for 5 minutes. 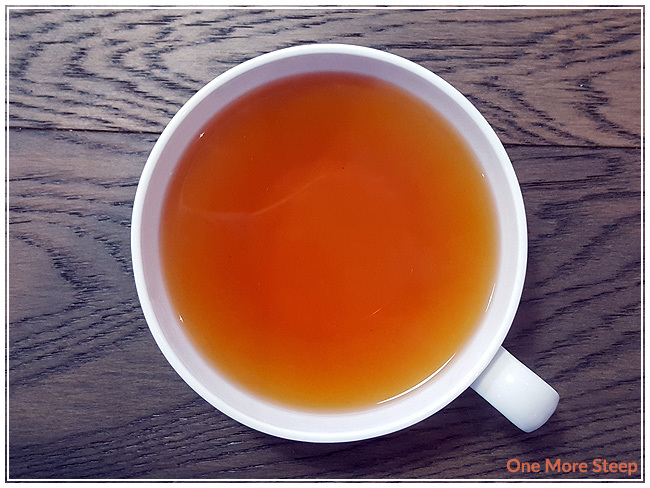 Paris steeps to a beautiful golden orange, the aroma from this tea is nothing short of enticing. There’s the aromas of vanilla, citrus, and black currants. I can’t make out the fragrances of black or oolong tea in the steeped tea. On first sip, I note some sweetness to this tea. The vanilla notes make the tea have more of a cream flavouring to it, as it reminds me of baked goods. The citrus and black currants have great flavour, and there’s a robustness to this tea. It honestly reminds me a lot of an Earl Grey because of the bergamot, with an added lightness with the vanilla and fruitiness from the black currant. I resteeped Paris twice. I found that the flavours weren’t as strong as the first steep, but still palatable. I found that there’s still a sweetness to this tea, and the vanilla and bergamot was mostly still present However, the black currant is missing. The second resteep was very watery and not nearly as tasty. I would say that Paris is good for just one more steep. I loved Harney & Sons’ Paris. 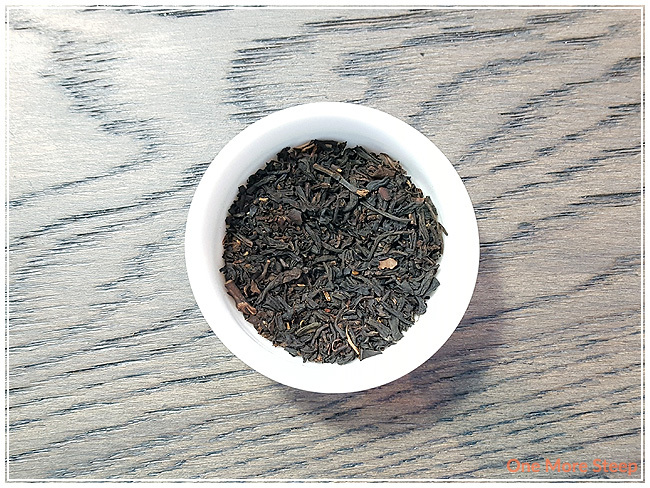 It’s a lovely black tea blend, and has a lovely fruity aroma and flavouring to it. I really enjoy the addition of vanilla, and the bergamot really reminds me of the classic Earl Grey – which is one of my favourites. 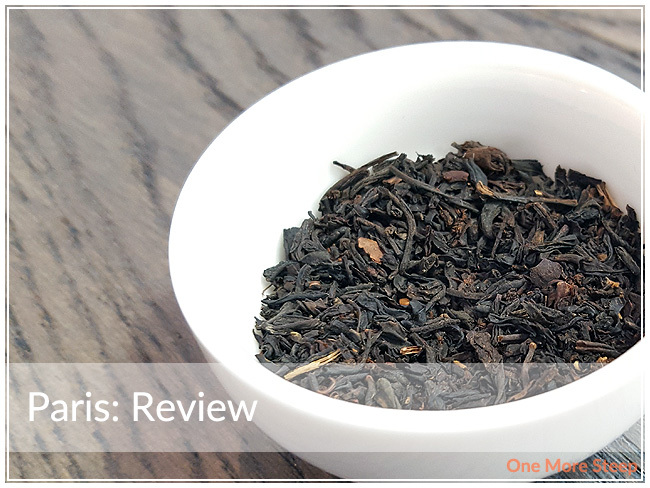 The creaminess that the vanilla adds to this tea is a welcome change from a classic, and I can see why Paris is one of Harney & Sons’ best selling teas. I think this tea would make an excellent afternoon tea selection with the sweetness and vanilla to compliment the macarons and other desserts.